Galina gave me the pattern for her kimono-style jacket. I had a look at photographs of the original Yamamoto suit (her inspiration) to discover more about the construction techniques and ideal fabric choices. I have commissioned Galina to make this suit for me. In the meantime I could not wait to experiment with the pattern. Galina gave me a small piece of paper on which she had drawn a scale diagram plus measurements. On a single layer of fabric I cut out the pieces. All seams are on the the straight or cross grain, with right and 45 degree angles. There are two pieces (or three if the collar is joined at CB). I had to join the front and collar piece as I accidentally separated it at the CB seam, but would cut the front in one piece next time. The pattern requires a gusset, as can be seen from the picture at the top. Galina assumed I could work it out for myself, and I had a try, but I am not sure I got it right. As this is just a first attempt toile the only thing to do is experiment and guess. I don’t know if you have ever put in a gusset, but it is not the easiest thing to do. 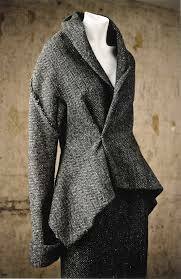 Of course this jacket is designed for a slightly rustic, textured, soft woolen cloth. I considered various wools including a double faced cloth (navy and cream), a white/blue/brown plaid, a light grey jersey with outsized rib, a gorgeous burnt orange with a nice diagonal weave (absolutely the wrong colour for me), a black and grey version of my squiggle fabric (I don’t suit black). In the end I found something interesting to work with (quite different from the fabric chosen by the designer). At Simply Fabrics I found two dozen rolls of narrow width woven pure silks. The pieces appeared to be 164cms long, and just 67cms wide. They have a selvedge on only one edge, implying they are cut down. I have no idea what this fabric is used for – ties? waistcoats? some sort of lining? 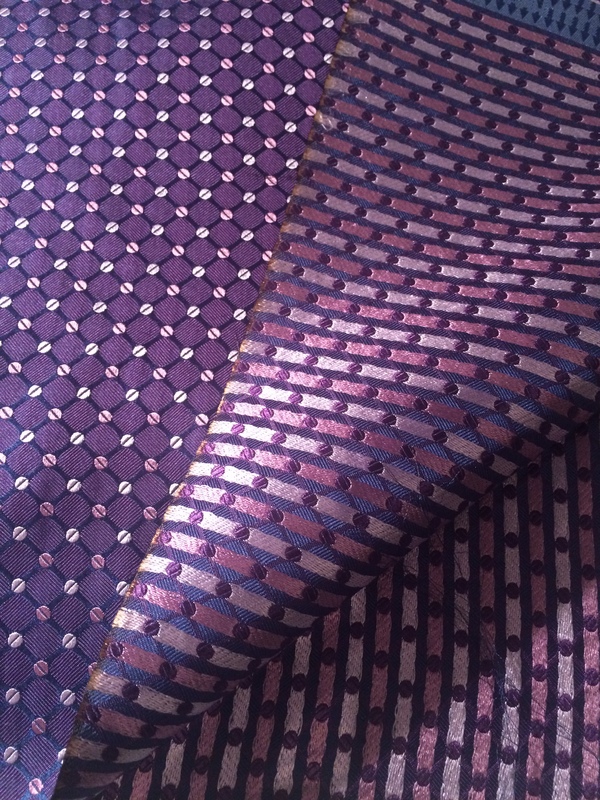 Anyway at £2 a metre it was cheap and I am always attracted to lustrous, shiny fabrics (although I rarely wear them). I dithered in the shop but got it anyway so I could test the pattern. Sew2Pro recently mentioned she like working with leather because of the smell. This was the opposite. I imagine that these small rolls of silk have been sitting in a warehouse, or in a musty cupboard somewhere for quite some time, imparting an unpleasant tang. I thought about giving it a wash but such was my impatience that I just went for it. The weave is made up of navy, white and pink, creating an overall look of purple. The underside is quite distinctive with a nice, stripey look created by the long threads being carried across behind the dots. It creates fragility but I thought it might give an interesting contrast to the jacket. I pinned it together on Camilla. I then machine basted it on one side and tried it on. It is a thrilling pattern with the back yoke seam contining down the sleeves. It feels a litle as if the waist is around 1″ too high, and the sleeves are way too long for me (I dislike wearing long sleeves, however elegant they look). Of course in this fabric it does look a bit like a smoking jacket or dressing gown. Having tested the fit (which was fine), I stitched it up. I made a wide belt sufficient to circumnavigate me twice, and tied it at the side with a bow. I am off out tonight to friends for drinks and it looks nice with my navy layered skirt. I have put on some perfume (and Galina’s necklace), and hope that I don’t smell like a manky old Macclesfield tie-maker. Wow! Gorgeous, arty and stylish! Wow you look fantastic and in my favourite colour too. That is a statement piece alright. 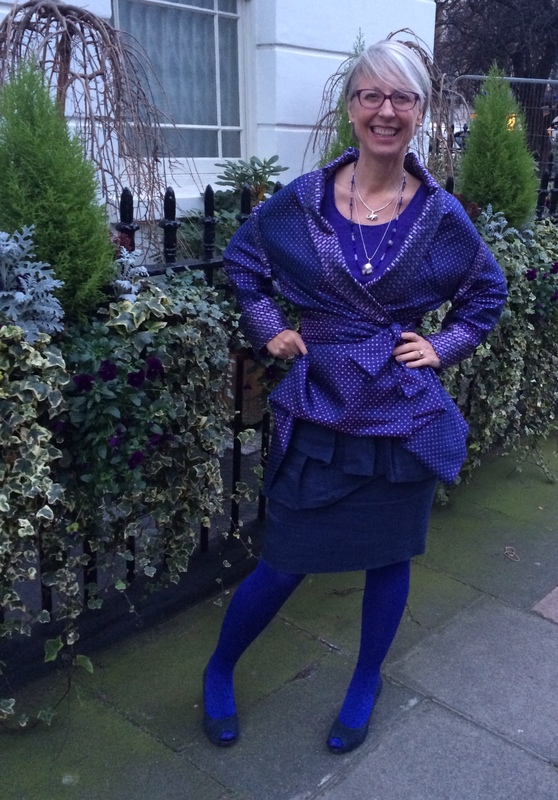 Sassy, Vibrant, Arty and Purple (and before you are old too!) I love it. Wow, and a matching necklace! Well done, Kate! Yes, the gusset still needs to be solved and is the trickiest bit. I have ordered more fabric to experiment:) I think the pattern is constructed in a similar way to the free Yamamoto pattern you mentioned before. Your woven silk looks so different at close up, very interesting. Also I’m curious about the skirt you’re wearing. Could you showcase it as a separate piece? I am afraid the skirt is RTW. Just a skirt with a trimming. I will send you a close up. I am designing a kimono sleeved jacket right now. Really exciting! A perfect. reversible fabric for this design. Thoroughly enjoy your journey. I want this pattern too!!!! What a lovely jacket–and that color is absolutely stunning! Wow! looks like a very fun project! Very good work! The pattern is in beta, and is just a set of measurements on a piece of paper. Over time making this into a multi-size pattern may be possible, but I think it would need quite a few variations. There is the free Yamamoto download you could try if you are interested.